1950s Two 1950s slides of a an unknown marathon. You can see a t-shirt that reads "North Medford". Perhaps this is the North Medford Running Club in Fitchburg, Massachusettes? November 1961 A Cuban Missle Crisis-era photograph of a woman in her robe cooking bacon for breakfast. Of course she is using a cast iron skillet. Of course an electric coffee percolator sits near by. Of course there is a bread box, a loaf of white bread, a can of V8, a bottle of Lux and a can of Pet Milk sitting on the turquoise trimmed counter top. Sigh. 1970s 9 Kodachromes showing a Christmas Cheer for Children toy drive display at a New York City department store in 1969. Participants included Local 817 I.B.E.W., Chrysler Corporation, Meyer, Strong & Jones, K&F, Williams Brothers, Local #3 Electricians, Hammermill Paper Company, Warner Brothers, Seven Arts, Alcoa and Pan Am. Toys and dolls shown include Betsy Wetsy, Voice Control Kennedy Airport, Tarzan Punching Bag, Dotti, Radio King, Suzy Homemaker, Solarscope, Schatzie Hound, Fisher Price Creative Coaster, Sweet Debbie Eve Doll, Winnie the Pooh, Table Top Pool, Bicycles, Dare Devil, Baby Angel Doll, Tinkertoy, Spiderman, Handy Kitchen, Tip-It, Easy Money, Pop Yer Top!, Go To The Head Of The Class, Operation, Kookie Kamera, Knock The Clock, Play-Doh Fun Factory and more. January 1962 A boy riding a beautiful green bicycle in 1962. In the background - vintage bike, tricycle, wagon, pedal car and automobiles. I think that the tag on the car in the foreground says "California." 1955 3 red framed Kodachromes slides showing women congregating outside after church in Indiana in 1951. 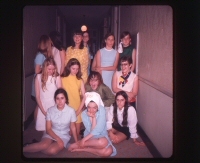 April 1970 Fun lot of 47 transparencies documenting an 8th grade class field trip to Washington DC. All of the students are female so perhaps this was a private school for girls? September 1958 A single slide showing friends grilling in the backyard in the late 1950s. Beer and waving is also involved. Not sure what the neighbors with the whites hanigng out on the clothes line think about the smoke from grilled flesh drifting into their yard. 1959 5 slides of a 1959 picnic - possibly at or near trip Willow Grove Amusement Park in Willow Grove, Pennsylvania. 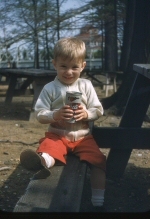 Check out the picture of Junior posing with a beer. Don't post THAT one on Facebook, Pa! Family - Look at Dad's Socks! January 1964 I have no idea what this is about. There is one photograph of a large building, most likely a dealership, with a Chevrolet sign on top. Other signs read "'64 Chevy Time - Chevrolet * Chevelle * Corvair * Chevy * Corvette * Trucks." There is a parade float just entering the scene on the right which appears to read Land of Lincoln and Illinois. People are gathered on both sides of the street and there are mountains in the background. 1950s 1 red framed Kodachrome showing men around a fire pit a night with marshmallows. Run Hershey bars! Run! September 1967 One slide from September 1967 showing a girl boarding a school bus. "1st Day of School" is written on the slide frame. April 1965 1 slide labeled "Ormandy-Philly Symphony" which I interpret as Eugene Ormandy - Philadelphia Symphony. 1950s 1 red framed Kodachrome of a man in a small boat on the Colorado River in the 1950s. October 1958 1 Kodachrome showing a man floating and drinking a beer in the backyard pool while his son looks on. Pretty red tricycle in the background. Circa 1960 A single slide of an elderly couple posing in front of a giant box with a Zenith color TV inside. Either it is a proud purchase or possible they are posing after winning it in a contest? 1950s 3 red bordered Kodachromes of performers from plays or revues. 1990s 3 slides showing the NFL's Kansas City Chiefs playing the Cleveland Browns at Arrowhead Stadium. This was Steve DeBerg/Derrick Thomas/Marty Schottenheimer/Christian Okoye era - late 1980s or early 1990s. 1950s 1 red border Kodachrome showing children dancing at a formal event while adults look on. August 1st, 1975 12 pictures from the Annual 1975 Festival in Black in Los Angeles County. I think this was the 8th event. Mostly pictures of the art and craft displays. The outdoor shots have a pink tinge. July 1962 9 nice slides of a Little League baseball game in progress. It appears that it's being played at Santa Fe High School in Southern California. Some of the team sponsers are Richard's Mens Store and Crown Savings & Loan. 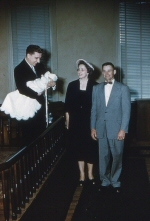 1950s 1 red border Kodachrome either of a christening or two people happy that their lost child was discovered under a pew by a minister. July 1982 One picture of a woman wading in a river in the 80s. The date stamped on the slide and the perm say 1982. April 1963 Three women in formal dress sitting on a couch in a living room in 1963. 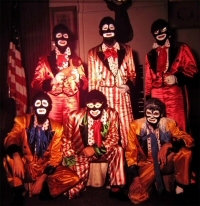 March 1964 36 nice 5x5 Ektachrome Transparencies of a 1964 Elk Lodge Minstrel Show complete with members performing in blackface. I had to use photographs because my slide scanner does not accomodate the 5x5 format. October 1962 Five slides showing a little league baseball trophy presentation. Most likely in Southern California. 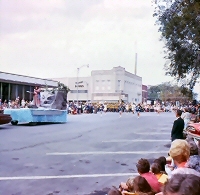 October 1971 10 slides showing a Christian-themed parade through a small town's main street. You can see a Reynolds Drugs building in the background. That narrows it down to Atchison, KS, Birmingham, AL or Clinton, NC. 1950s 1 blurry red framed Kodachrome showing people water skiing in the cover of a lake. October 1974 16 slides showing the results of a train wreck at or near the U.S. Naval Air Station in Glenview, IL. 1950s 15 slides from the 1950s of the Christian Brothers Circus, set up near the now razed Municipal Lakefront Stadium in Cleveland Ohio. Pictures include stadium, animals, tents. 1963 About 22 slides of a home being built on a hill in November of 1963. Features the home in various stages and a variety of vintage construction trucks and equipment. September 1959 14 slides of some sort of celebration or event. The bulk of the photos are of the "royalty" in a presentation scenario or ceremony and and then waving from their car. Also includes pictures of a formal dance and some buildings. Possibly Utah? November 1961 Ten 35mm slides of the Confetti Ball in 1961, featuring the band Bob Rogers and his Sunset Orchestra. Nearly all of the pictures are of the band. 1961 19 slides of an annual Thanksgiving Santa Parade, possibly in London, Ontario. Includes pictures of tractors and trucks pulling floats of Christmas and Mother Goose characters. November 1962 29 slides of an annual Thanksgiving Santa Parade, possibly in London, Ontario. Floats or businesses include Eatons, Hamilton Road Business Men's Association, YMCA & The London Free Press. "GARDEN TOURS Jacqueline Kennedy's love for gardens was well known. "In one of her rare public appearances," wrote Cathedral Age in 1961, "Mrs. John F. Kennedy cut the ribbon officially opening the annual Flower Mart. . . . wearing a jonquil-yellow wool suit and matching straw hat that were as bright and sunny as the weather." Mrs. Kennedy was saluting the work of the All Hallows Guild in maintaining and renewing the spectacular Cathedral gardens and grounds. Today All Hallows Guild docents lead tours of the Bishop's Garden, renowned for its roses, perennial border, herb garden, and medieval sculpture." 1965 15 old slides of an annual Thanksgiving Santa Parade, possibly in London, Ontario. A few nice pictures of the Esquire Hotel - "Ladies and Escorts" in neon. 50s-60s 20 images - mostly of a church being constructed and the surrounding community. 1950s 1 red border Kodachrome of two girls on a swing set in the 1950s. September 1983 A table set with a collection of party snacks and a cake that reads D.H.S. Class of 1948. Snacks include Cheetoes, Mini sausages and cheese with toothpick handles, olives, crackers and a meat-based dip, potato chips and dip and a vegetable tray with radishes and celery. I'll stake my crumbling reputation on the H.S. in D.H.S. stranding for High School. May 1966 15 slides of a parade through a shopping district. Possibly in London Ontario in Canada. You can see the Esquire Hotel, the Woodstock Lions float, the Erindale Lions Club float, Postian's, Esso and Lindsay Lions float. 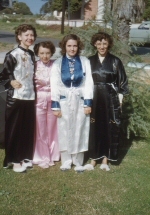 1950s One red framed Kodachrome showing 4 women dressed in some sort of costumes. Some of them look Majorette-ish. 1961 17 slides from Veterans Day parade in New Brighton PA. Includes 2 pictures of a truck wreck. Signs read "Zeiders Clothiers", "Hearing Aid Center", "J.S. Gary", "Record Shop", "American Legion", "Coultans Finance Corporation", "Dale L. Miller" and more. 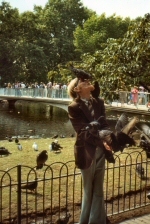 1982 One 1982 photograph of 2 ladies feeding the pigeons on a park bench near Buckingham Palace. 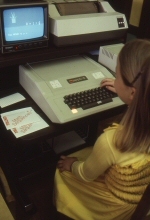 1982 Children and adults using an Apple II computer on Panasonic monitors in 1982 at a school in Wakefiled, MA. The students are running the Math Sequences program. The adults seem to be managing school inventory. 1957 A collection of wonderful lot slides from Quebec and Alberta Canada. Some of them are marked (I think) McCleod. There are about 24. One of them has a warped cardboard frame. November 1961 4 Kodachrome Transparencies from 1961 showing a high school football game or scrimmage. 1973 13 pictures from a 1973 cruise on the SS Emerald Seas. July 1962 4 Kodachrome Transparencies from 1962 showing a high school baseball game. 1966 Nine 35mm slides, most from the 1966 Schenectady Winter Carnival Parade in New York. There are 3 other years of the parade on the site. The photographer was stationed in roughly the same place every time so each year you can see glimpses of local businesses like the Delicatessen, Fedders Air Conditioning, the liquor store, Latourm, the Chevron Station and Adirondack Tire. 1967 Nine 35mm slides, most from the 1967 Schenectady Winter Carnival Parade in New York. There are 3 other years of the parade on the site. The photographer was stationed in roughly the same place every time so each year you can see glimpses of local businesses like the Delicatessen, Fedders Air Conditioning, the liquor store, Latourm, the Chevron Station and Adirondack Tire. Hole in ice event. There are several pictures of this process. 1968 Seven 35mm slides, most from the 1968 Schenectady Winter Carnival Parade in New York. There are 3 other years of the parade on the site. The photographer was stationed in roughly the same place every time so each year you can see glimpses of local businesses like the Delicatessen, Fedders Air Conditioning, the liquor store, Latourm, the Chevron Station and Adirondack Tire. 1969 Twenty one 35mm slides, most from the 1969 Schenectady Winter Carnival Parade in New York. There are 3 other years of the parade on the site. The photographer was stationed in roughly the same place every time so each year you can see glimpses of local businesses like the Delicatessen, Fedders Air Conditioning, the liquor store, Latourm, the Chevron Station and Adirondack Tire. 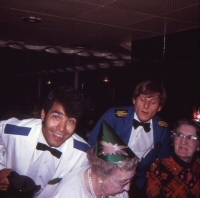 1960s 20 slides of a Shriner's party featuring entertainment by The Red Ruhl Group. Some of the frames are warped. 1982 One picture from 1982 showing a man draped in European Starlings while people watch from a distance. The birds seem to be eating something from his mouth? The slide is titled Birdman of London. September 1971 1 slide showing a heavy duty snowblower clearing a parking lot somewhere. June 1972 One picture of an antique car show taken in 1972. It just shows a portion of two rows of cars. I can make out that the one in the foreground is a Hudson. September 1963 One picture of a parade in 1963. The participants at this point in the parade are all female and dressed in gowns, crowns etc. September 1970 4 Ektachrome slides from a religious event that included evangleist Billy Graham. 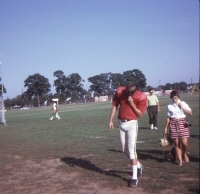 August 1970 8 blurry slides of a 1970 High School football game or scrimmage. July 1960 7 pictures, most of a 1960 Little Leage baseball game. The scoreboard reads "Norwood Village National Little League" which I think is in Southern California.